Conveniently located at less than 500 meters from the Louvre, near the Opera Garnier and the department stores, the Hotel Louvre Richelieu is certainly one of the best values in this prestigious area. It offers 13 newly renovated rooms, decorated in a contemporary style. 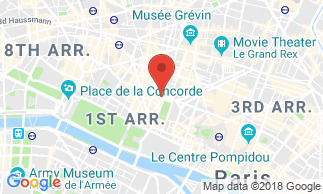 Whether you are in Paris for business or for leisure, you will be in the heart of the City of Lights: the main tourist attractions are all reachable within a short walking distance and the area abounds with numerous restaurants with the most varied cuisines and for all budgets. The Louvre Richelieu Hotel offers 13 rooms with private bathrooms. They have all been recently renovated in a contemporary style, combining comfort and modernity. Espacially designed for your relaxation, the Comfort rooms are a haven of peace amidst the bustle of Paris. They are soundproofed, air conditioned and equipped with modern facilities. For your comfort, we chose a contemporary and relaxing design as well as excellent bedding. The furthermore feature a flat-screen TV (26''), free Wi-Fi access, a desk and a safe. Renovated in late 2014, these rooms have the same characteristics as the Comfort rooms, including excellent bedding and a contemporary design. They do not have air conditioning and the equipment of the bathrooms is less luxurious, therefore we offer them at a lower price. (Note that Classic rooms vary in size, some are smaller than others). After 4 pm, the bar is open in the dining room. There, wi offer you at very reasonable prices soft drinks, beer and champagne, and soon some wines of France. The hotel is located in a building dating from the mid 17th century as the many houses in the Palais Royal district (no lift/elevator). The Louvre Richelieu Hotel is ideally located in the heart of Paris, just 500 metres from the Louvre Museum, near the Jardin des Tuileries, the Palais Royal, Place Vendome and the department stores 'Printemps' and 'Galeries Lafayette'. The main tourist attractions are all reachable within less than 30 minutes walk and the area abounds with numerous restaurants with the most varied cuisines and for all budgets.